Good grant writers follow a proven formula that results in successful funding and most importantly, grant implementation. This course covers the elements to include when writing a grant, including the do’s and don’t of granting. We cover the critical elements necessary for getting your grant funded. 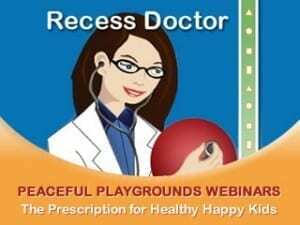 Finally, the course concludes with information and resources available through Peaceful Playgrounds to assist you in your grant writing efforts. Don’t miss this opportunity to hear practical advice from an experienced and successful grant writer. Dr. Bossenmeyer’s grant writing has secured more than $10 Million in funded educational grants. 1. To learn the common elements that need to be included in a grant application. 2. To learn how to find funding sources for your project. 3. 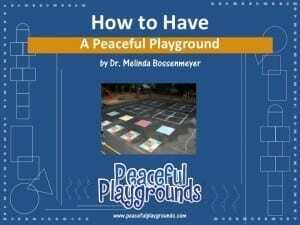 To understand how Peaceful Playgrounds resources can support you in your grant writing efforts. Introduction- The begins with the process of writing a grant and determining if you have the support within your organization to complete the grant writing process. Section 1 Organizational Capacity- Does your organization have specific requirements for submitting a grant. Determining if your organization has support personnel to assist you in the grant writing process. Section 2 Identifying Funding Sources-We start by introducing the procedure for determining which grant your organization is eligible for. The course continues with a review of Federal Grants and common grant writing requirements. Section 2 also looks at the benefits of local, Foundation, and state grant proposals including required elements. Section 3 Developing a grant proposal. Section three look at the writing process after all the information is gathered for writing the grant. We review the most common elements of most grant proposals. Section 3 discusses essential elements to include in your grant proposal and provides tips on what should be in each section. We cover the following grant writing elements: Abstract, Program Overview, Needs Section, Grant Goals and Objectives, Description of Implementation Activities, Evaluation and what to include in the Budget. 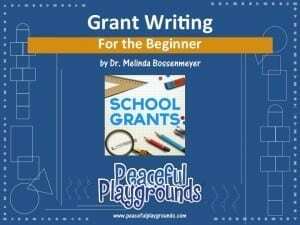 Section 4 Final Grant Writing Tips- Section 4 makes suggestions for what successful applicants include to strengthen their grant and what resources are available through Peaceful Playgrounds to assist you in your grant writing efforts. The Grant Writing for the Beginner Course is designed for administrators, teachers, physical educators, parents, after school personnel, assigned the responsibility of writing and submitting a grant. The following learning materials are available for download at the conclusion of the course from our grants page on the website. 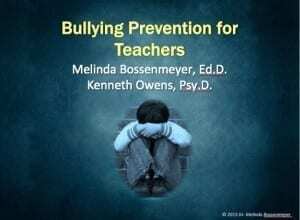 Melinda Bossenmeyer, Ed.D. holds a doctorate in Educational Leadership from U.C.L.A. 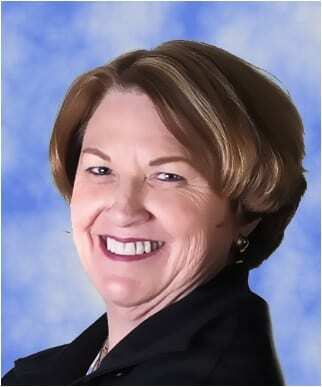 She has an MS and BS in Kinesiology from California State University Fullerton. She holds a K-12 teaching credential in Kinesiology and Health. She holds a K-16 Administrator Clear Credential from UCLA. *Special Pricing for school groups and districts are available. Please contact us at 951-245-6970 for more information.